IGT tumbled after a Q4 report that once again disappointed investors. There's a growing sense here that the company can't quite fulfill its promises - or its potential. At the same time, however, a cheaper price, a 5.8% yield, and an intriguing qualitative story still make IGT attractive. The story stays frustrating - but there still seems to be upside from $14. One of the primary issues with slot machine and lottery provider International Game Technology (IGT) is that it's exceedingly difficult to value the company on a fundamental basis. Scientific Games (SGMS) is the most obvious and logical peer, but it closed 2018 with a net leverage ratio of 6.8x EBITDA. That fact alone skews comparisons significantly: SGMS logically can't trade below 7x on an EV/EBITDA basis, but IGT can (and in fact does at the moment). There are more factors that make targeting an exact price difficult. The equity slice is thin (barely a quarter of enterprise value), so any model inputs are magnified in share price outputs. Free cash flow is exceedingly lumpy owing to upfront payments for lottery contracts, primarily in Italy: FCF actually has been negative the past three years, including a $500 million burn in 2018, per figures from the 20-F. Non-controlling interests (due largely to a consortium that services the Italian lotto contract) aren't excluded from Adjusted EBITDA - and aren't cleanly broken out from the figure. This simply isn't a stock where an investor, with any real confidence, can point to a specific price target. There is a significant "garbage in, garbage out" problem when it comes to IGT stock. So this becomes more of a 'feel' case - and of late, that hasn't been good news for IGT stock. A disappointing Q4 earnings report last month led IGT stock to its lowest point since the 2015 acquisition of IGT by Italy's GTECH (the combined company kept the IGT name), save for a very brief dip during the early 2016 correction. That report - which included both below-consensus results and what looks like unsatisfactory guidance for 2019 - fed the core concern here: IGT simply isn't getting it done. It's overpromised repeatedly since the merger. Meanwhile, EBITDA still sits well below the figures reached by the respective companies before the combination. A stagnant, leveraged business with cyclical risk in gaming and political risk in Italy hardly looks like a sure thing. That said, aspects of the release, and the outlook, still support a brighter outlook for IGT. Free cash flow is going to turn positive - and sharply so, one reason I went long the stock in February. The gaming business, long a laggard but a key driver of any potential upside, is showing signs of life. I called IGT a high-risk buy back in early February - and even with Q4, I still think that's the case. The core bearish takeaway from Q4 is that this is the "same old, same old" from IGT. The company actually raised full-year EBITDA guidance after the Q3 report in late October, leading the stock to jump 12%. Broad market weakness led IGT to give back those gains - and then some - in a matter of weeks, but with the better guidance and a long-awaited stabilization in the installed base at casino customers, there was some reason for optimism. In addition, IGT already had tipped a strong 2019-2020 stretch at its Investor Day in August, pointing to the end of lottery payments as a catalyst for annual free cash flow of $450-$550 million over the two years. That said, the outlook for 2019 appears disappointing. Adjusted EBITDA is forecast at $1.7-$1.76 billion - pretty much zero growth year-over-year. And the guidance for free cash flow the next two years was pulled down as well. the balance (of a total $100M+), or something like $15-$20 million, from the loss of the contract in Illinois by the company's Northstar joint venture. The problem is that those headwinds, currency aside, aren't exactly immaterial, external, and/or one-time. The new gaming taxes support the fear that the Italian government - in a market that accounted for 40%+ of 2018 EBITDA - is going to keep taking more of the company's profits as it manages political unrest and a stagnant economy. The Northstar JV was an epic disaster, when judged even by the low standards of my home state. The Mega Millions boost colors Q4 results - and drove close to one-third of the company's cited organic EBITDA growth for the full year. That and FX aside, 2018 growth was in the high 2% range - and the midpoint of 2019 guidance suggests a similar result this year. Meanwhile, free cash flow guidance was pulled down as well. Deutsche Bank (DB) analyst Carlo Santarelli asked in the Q&A of the Q4 call whether the company's $450-$550 million target given at Investor Day was still intact. CFO Alberto Fornaro noted "one exception" to the model: the new gaming taxes. That impact has risen, from an estimated $15-$20 million next year at the time of the Q3 call to the current ~$40 million. Assuming some income tax help on the loss, that in turn suggests FCF expectations need to be pulled down to ~$420-$520M - about a 6% decline at the midpoint. But there's more to it than that. Lower free cash flow slows the deleveraging story here, if modestly. And it adds to the sense that IGT keeps overpromising. At the end of 2015, the company guided for $500 million a year in average free cash flow over the next five years (spreading out the upfront Italian lotto payments). That guidance was badly missed - and now IGT already is pulling back on a shorter-term and less onerous projection. Can IGT management be trusted? Does it really have its arms around the potential issues in Italy? All that said, I'm not quite ready to toss the bull case out here. The qualitative case for IGT is that the Italy business is better than investors might think, given the challenges; the North America lottery business is a stable source of profits and cash flow; and the Gaming business has room for a turnaround, which given balance sheet and operating leverage can have a significant upside impact on IGT equity. The North America lottery business, even excluding the help from Mega Millions, performed well, with instants & draw games revenue up 5%. (Multistate jackpot sales rose a staggering 143%.) Illinois is being lost, but that aside IGT seems reasonably solid from a contract standpoint. And Gaming is showing signs of life. The installed base in North America rose 1.3% year-over-year in Q4 - not torrid growth, but a notable step after years of erosion. Replacement units shipped rose 44% in the quarter, and on the Q4 call management cited "a record number" in North America, with 6%+ unit growth for the full year. Suppliers like IGT and SGMS have been waiting literally for years for the replacement cycle to arrive, as margin-conscious operators have been rewarded by the market for pinching pennies. It's starting to look like the wait might be over. SGMS has struggled of late, but smaller provider Everi Holdings (EVRI) has broken out after a solid Q4 report. Overall commentary across the space seems stronger. Meanwhile, IGT appears to be taking share, per industry analyst Eilers & Krejcik, with that analyst citing strength in wide-area progressives and its Scarab and Ocean Magic Grand reel games. The International segment did have a disappointing quarter - and a poor year from a profit standpoint, with operating income down 13% after a 15% increase a year ago. But that's not particularly surprising given weakness in Europe and Latin America (along with currency effects in both regions), and that segment is the smallest of the four that IGT reports. The broad take here from a bullish standpoint is that the story still holds - particularly at a lower price. The higher tax impact in Italy is disappointing - but maybe not enough so to suggest a $600M+ market cap compression since the earnings report. North American gaming is starting to show signs of life. The Lottery business is fine in North America, and decent (ex-currency) overseas. And the deleveraging story still can get some help from 2019-2020 free cash flow. The risks are real, and material - but that's been the case since the merger (and even before). IGT still seems like it's worth taking on those risks. For the most part, I still see the bull case as intriguing enough in the context of the valuation. At ~7x EBITDA even backing out non-controlling interests, IGT is the cheapest play in the space. Even the low end of cash flow targets, normalized for the higher-than-expected gaming taxes in Italy, puts the P/FCF multiple in the similar 7x range. Dividends will eat up $160 million-plus on that cash flow - but there still will be plenty to put toward deleveraging, which should lower interest expense and get net leverage toward (though likely not all the way to) a more reasonable 4x. Looked at another way, IGT has been disappointing - but to some extent that's priced in. Admittedly, it's dangerous to argue that anything is 'truly priced in' when the equity slice is 25%+ of EV and net leverage is 4.5x. But 2019 expectations - for modest constant-currency profit growth - are good enough, even if they might not be quite what they were 6-8 months ago. And the strength in Gaming represents a real catalyst that can help fundamentally - as incremental EBITDA drops almost straight to free cash flow - and qualitatively, if the "lost in the woods" narrative that has defined IGT for most of this decade starts to fade. History and peers show that IGT can get an 8x EBITDA multiple - which even backing out cash flow to JV partners suggests something like 50% upside. Deleveraging is another catalyst in terms of both free cash flow and a growing equity slice. This is a stock that traded at $30+ less than a year ago. The average analyst target price is $22+ (that's not definitive for the bull case, but I generally think more highly of gaming analysts than those in other sectors). If IGT can deliver in 2019, there is a path to significant upside from $14. It's a high-risk case, to be sure, for myriad reasons. The largest reason is that if IGT disappoints again, it's going to be tough for the company to recover. The upfront payments have been made in Italy. The gaming business is headed in the right direction. The lottery business should be clean from a renewal standpoint for at least this year. 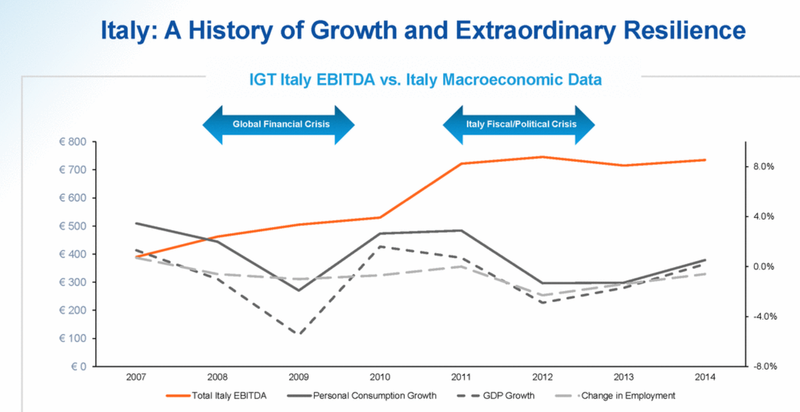 If IGT is going to capitalize - and start regaining investor confidence - it has to do so now. There's enough potential upside here to bet that it will. Disclosure: I am/we are long IGT. I wrote this article myself, and it expresses my own opinions. I am not receiving compensation for it (other than from Seeking Alpha). I have no business relationship with any company whose stock is mentioned in this article.